Other Types of Power Factor Correction Capacitors according to Location. This type of compensation has many other names like Group, bank, bulk or by-sector compensation. Electrical machines that are always switched on at the same time can be combined as a group and have a joint correction capacitor (see Fig.1). An appropriately sized unit is therefore installed instead of several smaller individual capacitors as in individual compensation. This configuration is convenient for a wide installation, with workshops having different load factors. This configuration has Similar advantages to those for individual power factor correction, but more cost-effective. By other way, installing capacitors between the upstream circuit breaker & the contactor or at the main distribution bus ensures lower installation cost since you install fewer banks in large KVAR blocks. A separate disconnect switch and over current protection is required. If your facility has excess current carrying capacity, you can install capacitor banks at main feeders as group compensation. This type of compensation has many other names like Central or global compensation. 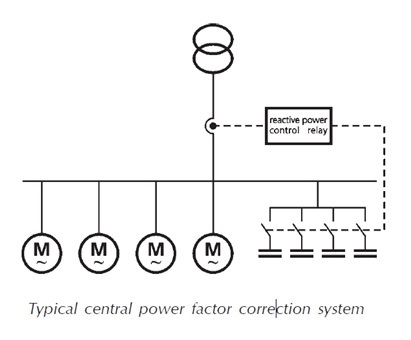 Central power factor compensation is applied for electrical systems with fluctuating loads. The power factor correction capacitances are installed at a central point, for example, at the main low voltage distribution board MLTP or at the incoming plant service before transformer (see Fig.2). The capacitors are divided into several sections which are automatically controlled by a microprocessor based relay which continuously monitors the power factor of the total current supplied to the distribution board. The relay –by using contactors - connects or disconnects capacitors to supply capacitance as needed in a fashion to maintain a power factor better than a preset limit (typically 0.95). Ideally, the power factor should be as close to unity as possible. For installations with many loads, where not all the loads function simultaneously and/or some loads are connected for just a few hours a day, it is evident that the solution of distributed power factor correction becomes too onerous since many of the installed capacitors stay idle for a long time. Therefore the use of one compensation system only located at the origin of the installation allows a remarkable reduction of the total power of the installed capacitors. Automatic switching ensures the exact amount of power factor correction and eliminates over-capacitance and resulting over-voltages. This type of compensation has many other names like Mixed, hybrid or combined compensation. 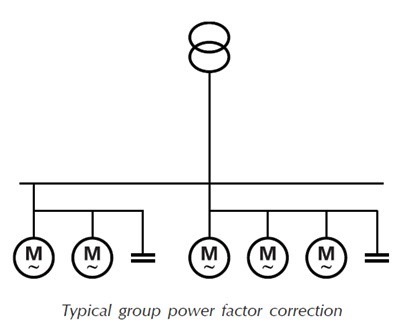 This configuration derives from a compromise between the three solutions of individual, group and centralized power factor correction and it exploits the advantages they offer (see Fig.3). In such way, the individual compensation is used for high power electrical equipment and the group and/or centralized modality for the remaining part. Economic considerations often show that it is advantageous to combine the three methods described above. Hybrid power factor correction is prevailingly used in Installations not operating continuously and which may be supplied at high voltage but with low voltage loads. So, we should employ individual PFC for large / high voltage equipment and employ group and/or central low voltage capacitors for power factor improvement on Low voltage switch gear. This is much cheaper than adding the power factor improvement needed for low voltage loads with that of high voltage equipment because low voltage capacitors is available with much lower ratings which enable relatively small capacitor steps (100 KVAR and below) to be employed for automatically controlled capacitors. This ensures flexibility of operation without excessive switchgear costs. The advantages and disadvantages of the hybrid compensation are same as discussed for the other three PFC types. The siting of the capacitors, does to some extent, depends on whether each piece of equipment (e.g. a motor or a transformer) is being individually corrected or the installation as a whole or part is being corrected as a central and/or group. In the first case the capacitor and the load (motor, transformer etc.) are as close together as possible. In the second case the capacitor is located at some convenient point in the system, such as a substation. In providing the power factor correction it should be remembered that distribution boards and circuits can carry a greater useful load if the capacitors are installed as near as possible to the source of low power factor. For this reason either group or individual correction, rather than central correction at the intake point, can almost invariably be justified. In an installation where the low voltage load is supplied from several distribution substations, local automatic control at each substation is generally much cheaper as well as operationally superior to an elaborate method of overall control operated from the point of incoming supply. After careful consideration of the advantages and disadvantages of the various installation options, care must be taken in sizing and placing power factor correction capacitors. Leading power factor, greater than 100%, must be avoided. The capacitors should only be on line when the load requires KVAR and disconnected when the load is reduced. Fig.4 shows the phases of Power Factor Correction Capacitors Sizing Calculations For Existing Installations. for the preliminary evaluation process. Step#1: Collect monthly billing data; this step is used to estimate how many capacitors are needed. Step#2: Make some preliminary measurements for current and voltage; this step is used to get a rough idea of how heavily loaded the plant cables and transformers are so that the loss savings can be better estimated. Step#3.D: Fill the Economic Evaluation Worksheet: Evaluate economics and calculate the payback, present worth and benefit/cost. Step#6: Compare the savings with the probable cost of capacitors' installation; this step is to determine if the capacitors' installation process still economical or not? If economical proceed with the design phase, if not stop or proceed uneconomically. In this phase, we will design and select the best economical, efficient and applicable power factor capacitor scheme for an installation. Fig.6 shows a typical flow chart for the Design process. Step#1: Performing a Detailed Plant Survey; this step is used to collect sufficient data about the plant to determine the optimal size of capacitor to place in each location. It is also for determining if there will be any detailed studies required to avoid some of the pitfalls associated with capacitor application. Step#1.A: Review One-Line Diagram; this step is used to make judgments about the most appropriate form of power factor correction. Step#1.B: Take into consideration the loads that produce harmonics or have sophisticated electronic controls that can interfere with power factor correction efforts. Step#1.C: collect sufficient data Inventory by using measuring instruments to understand how the system behaves so that optimal capacitor configurations may be determined. Step#2: Select Economical Capacitor Scheme; this step is used to find the lowest cost capacitor scheme that will adequately correct for the power factor while minimizing the losses. Step#3: Checking the "No Load" Voltage Rise: this step is used to check that if the Voltage Constraints Met or not. Step#4: Select Capacitor Switching Options. Step#5: Check the Harmonic Distortion and make Harmonic Mitigation Options; this step is used to check if the harmonic Constraints Met or not. Step#6: Use the Economic Screening Worksheet again; this step is used to evaluate the economics of the selected capacitor scheme, if economical then proceed with installation phase, if not, try to improve the economics by developing lower cost Capacitor Scheme or abort the design process. Step#1: Use the detailed loads schedules; this step is used to calculate the total KW, total KVAR and total existing PF at each feeder panel so that optimal capacitor configurations may be determined. 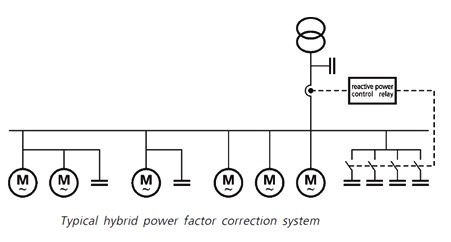 Step#2: Review One-Line Diagram; this step is used to make judgments about the most appropriate form of power factor correction. Step#3: check for Potentially Troublesome Loads; in this step, we will take into consideration the Several different kinds of loads that produce harmonics or have sophisticated electronic controls can interfere with power factor correction efforts. These loads like Adjustable speed drives, Variable frequency drives, DC Drives, Arc furnaces, large amounts of fluorescent or sodium-vapor lighting and Large UPS systems. Step#4: Select Economical Capacitor Scheme; this step is used to find the lowest cost capacitor scheme that will adequately correct for the power factor while minimizing the losses. Step#5: Develop a Fixed Capacitor Scheme: this step is used since the lowest cost installations are generally fixed capacitors with few additional accessories such as automatic switches and harmonic filters. Step#6: Checking the "No Load" Voltage Rise: this step is used to check that if the Voltage Constraints Met or not. Step#7: Select Capacitor Switching Options. Step#8: Check the Harmonic Distortion and make Harmonic Mitigation Options; this step is used to check if the harmonic Constraints Met or not. Step#9: Use the Economic Screening Worksheet; this step is used to evaluate the economics of the selected capacitor scheme, if economical then proceed with installation phase, if not, try to improve the economics by developing lower cost Capacitor Scheme or abort the design process. In the next article, we will continue explaining the above Power Factor Correction Capacitors Sizing Calculations Steps in detail. Please, keep following.